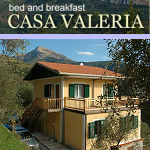 This page includes arriving in Italy and local attractions, places, restaurants and holiday property to rent. Ventimiglia is well positioned for the perfect weekend break or Summer/Winter vacation. 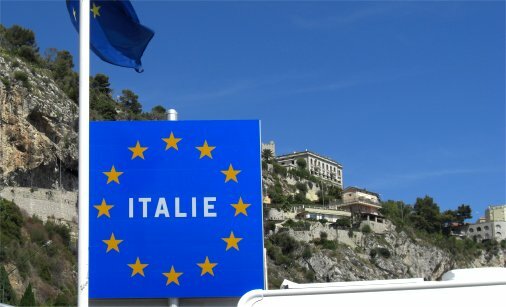 Being a frontier town it is also a nexus for travellers and backpackers to visit the rest of Italy and for those going through to France, Switzerland and the rest of mainland Europe, either by car or train. 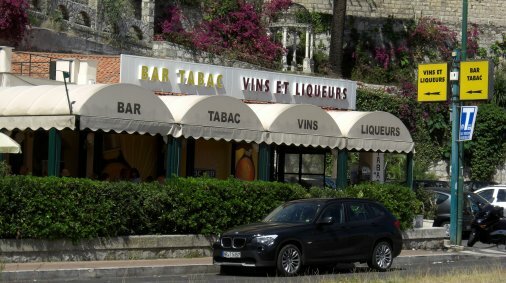 See the Trenitalia website.On the coast road from Menton in France, as you pass through the border, on the left is a Bar Tabac which is a great place to stop and experience the first tastes of Italy. It also has a petrol station and the small food and wine section is most appealing. 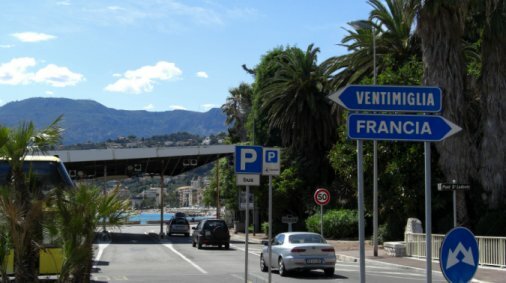 It is a great place to stop and take a coffee and enjoy the world go by for five minutes.Ventimiglia is about 8 kilometers from Menton on the French border. Direction Menton, France from Ventimiglia, Italy. Latte is the first area you will come to as you drive towards Ventimiglia via the coast road from France. 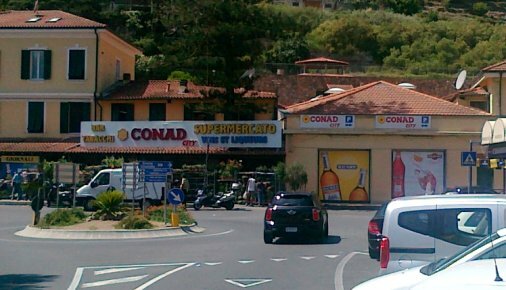 Your first introduction to Italy may be the Conad supermarket an odd but very well-known landmark that results from the heroic, “Open All Hours” efforts of one shopkeeper. The supermarket which is open every single day of the year from about 7.00 until 21.00 and sometimes later is one of the best places to stock up on good food and wine, whether you be a local or visitor. It has a wonderful ‘banco taglio’ – the delicatessan counter groaning with wonderful cooked meats, salamis and cheeses. The ‘pasticceria’ counter – cakes and pastries – is graced with delicacies such as cannoli and other tasty biscotti. The fresh cooked food section is extremely popular, especially during the Summer when local tourists and yacht owners take away picnics to enjoy onboard and by the sea. Fresh pasta dishes, roast potatoes, vegetables and meats, pizzas and focaccia are always available. The lungomare (promenade) is a wonderful stretch of coast road with incredible views as far as the Esterel on the French side. There are many restaurants and bars along the way with good friendly service, most serving the best Italian ice-cream. Most of the beach is free to enjoy and there are designated areas for you to bring your pet. Ventimiglia Alta (Old Town) sits behind this stretch of beach called ‘Carlo Alberto’ promenade (also called Funtanin). 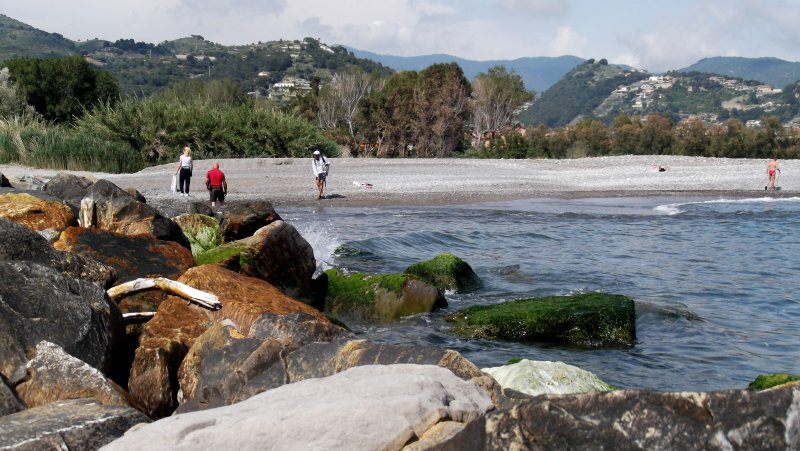 Ventimiglia beach is protected from coastal erosion by a series of man-made offshore reefs, a project that has been tried in only a few other places in the world. Over the years the action of the tides have shaped the beach into a series of scalloped bays that as well as being visually interesting are ideal for safe bathing for all ages. This successful project has caused so much new sand and shingle to arrive that some of the reefs can be reached directly on foot from the beach. At each end of the lungomare, where the rivers Roya and Nervia reach the sea, are wonderfully unspoilt and natural areas that are nature reserves for breeding birds. You will always see ducks and swans occupying the waters and in some years you may even get the chance to watch the local pair of swans bring a new family into the world, sometimes in full view of passing tourists. Truly idyllic spots and often something of a surprise to visitors. Over the bridge and you are in another popular spot, with some excellent fish restaurants. The visible cranes form part of a construction for a new marina called ‘Cala del Forte‘. The project started in 2009, with the laying of the first stone on Wednesday 23rd December. The following video, filmed in February 2010, captures the coastline just before the major works started. The walk towards Calandre beach is accessible but from various points above on the main S1 coming into Ventimiglia. This changes frequently, according to construction. When it comes to dining out and fine eating, you will never run out of places to enjoy great food. On coming through the border from Menton and opposite the Bar Tabac, is a little slip road taking you to Balzi Rossi. Here we find a beautiful restaurant situated on the sea front: Ristorante Balzi Rossi. The restaurant setting is amazing and close by is a natural rocky marble beach with crystal clear waters. Balzi Rossi is steeped in history and outstanding beauty. The restaurant makes an ideal venue for a party or function. 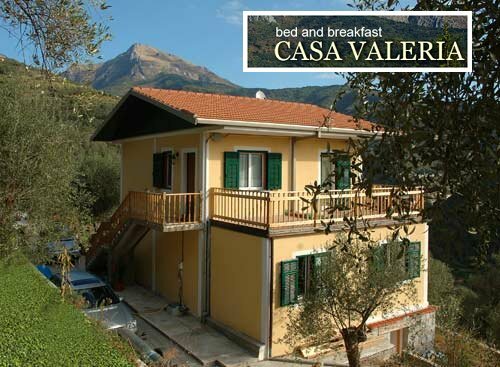 A warm Italian and English welcome can be found at Casa Valeria. The house is about 2 km from the unspoilt village of Pigna, in the Upper Nervia valley, between the Italian Riviera and the Ligurian Alps and about 17km from the centre of Ventimiglia. See the website here.